The FTSE is struggling on the open, down by some 30 points at 5775. We did see some buyers creeping into US stocks around their lows, but we have yet to see the same sort of buying for the FTSE or the DAX. Investor caution dominated the US session and rightly so as both Apple and Amazon disappointed. This led to the after hours sell-off which has knocked the European markets this morning. Even though many firms are missing their estimates, if we can take any good news from this US earnings season it's that very few seem to be concerned about the wider economic backdrop. Looking ahead to today, the key piece of data on trader's minds will be the Q3 US GDP reading, with expectations for a modest pick up from 1.3% to 1.9%. Having said that, for an economy that is 70% reliant on the consumer, to have two of the biggest consumer dependant stocks miss earnings has some traders cautious of a GDP disappointment. Also see today's feature on UK GDP Trading Update. Since the headlines are saying that Our Dave has given the game away on this morning's UK GDP, it would be disappointing to see a figure of less than the expected 0.6%. The GBP/USD spread trading market saw some strength yesterday, sustaining its gains after the PM's comments, and is still being pushed a little higher this morning. Even the FTSE futures are edging higher in early trade, as traders anticipate a solid rebound in growth. This could be setting us up for a classic case of 'buy the rumour, sell the fact'. Unfortunately, no matter how good today's data is, the UK economy is still flat-lining at best. We are expecting to see near-zero growth for this year, and the prospects for 2013 aren't all that much better. Today's figures will see a temporary boost from the Olympics but will also benefit from a falling unemployment rate, retail sales which have held up nicely and an expanding services sector. Nevertheless, according to the CBI, manufacturing output is at its lowest level for three years and the construction sector remains in the doldrums. On top of that, things on the continent do not seem to be improving after yesterday's raft of bad manufacturing and services data showed an even deeper contraction than was previously thought. Yesterday's modest improvement in the US housing sector figures was easily overshadowed by the Federal Reserve's comments regarding economic growth and employment. As widely anticipated, the benchmark interest rate in the US was left unchanged at 0.25%, however, the pace of growth remains anaemic and the jobless rate is still at elevated levels. This was enough to send the Dow almost 50 points lower to a close of 13,062. Nevertheless, this morning, the FTSE is starting the day with a spring in its step as the news flow overnight has been quite positive for the indices spread trading markets. I'd like to say that the buyers are creeping back in simply because of high expectations ahead of this morning's UK GDP data. However, it's more likely down to the fact that Japan has endorsed its next substantial stimulus package and China believes that output growth in the final quarter will be much better than in Q3. At the time of writing, the FTSE is at 5835, so the bulls will be looking to see a test of the near-term resistance at 5870, meanwhile support is seen at the recent lows around 5780. Online spread trading investors got a wake up call yesterday, with a sharp sell-off that saw the FTSE wipe out the hard work it had put in to get back above 5900. In the case of the DAX 30, its 2.1% decline was enough to send the index below the start of the gradual rally that we had seen over the last couple of weeks. This serves to remind investors that what goes up can go down, and highlights that the markets are really struggling to head higher at the moment. Even small gains feel like they've been hard won, whereas moves to the downside can be abrupt, large and without warning. Yesterday's sell-off was one of those that make you wonder if all the hard work of investment is worth it. Why go to the effort of careful stock-picking and analysis if, after ten days of nerve jangling rises, you make a 2% gain that is snuffed out in just a few hours. On reflection, the recent strength has been down to increased expectations of a Spanish bailout, rather than sound corporate fundamentals and the belief that stocks are genuinely undervalued. As a result, once the realisation started to set in that a Spanish bailout request may not be immediately forthcoming, many investors ran for the hills. Of course, as always, the remaining bulls may simply see this sell-off as yet another buying opportunity. Despite the various opinions over a Spanish bailout, many bulls were buying at 5900 with the view that the index will move above the 6000 level during 2013. With that logic, the index may not take long to get back up there. Certainly, many chartists will tell you that the uptrend remains intact, with the lower upward trendline at 5800 yet to be broken, although only just. Ahead of the open this morning, we had been calling the FTSE 100 around the 5815 mark following a US session that saw the Dow Jones continue its nosedive. This time, the Dow lost 252 points, closing at 13,112, as the US third quarter results disappointed investors once again, painting a gloomy outlook. Nevertheless, at the European open, the FTSE 100 is even lower than our original calls, trading at 5800 at the time of writing. The bulls will be nervous that yesterday's big fall could potentially be followed by another. Things start to get a little busier on the economic data front today, with PMI services and manufacturing numbers from the EU and Germany, as well as the latter's Ifo survey. We then get new home sales from the US at lunchtime and end up with the FOMC this evening. This has the potential to ignite some more flames of volatility, although little is expected in the way of any policy announcements from them. Well, if the polls from last night's final debate are anything to go by, Obama should be able to secure his second term as President of the United States. The event saw a mediocre performance from his rival, who kept trying to steer the debate towards the economy. Unfortunately for Mr Romney, the focus was on foreign policy, an area he has looked rather weak on, and he couldn't land any big blows. The markets are likely to welcome this result as it now seems more likely that we'll see the incumbent President remain in office. That result would remove any uncertainty over how the fiscal cliff would be dealt with under a Republican President. That said, there's still a few weeks of campaigning left and it's all to play for. There's even another Non-Farm Payroll figure to be released, although that may come too late for Romney, even if it does show a sudden spike in unemployment. Nevertheless, the most important issue for the US is the so called fiscal cliff; whoever gets into the White House will have to deal with this impending issue. Much has been made of the deadline on 1 January 2013, when new tax hikes and spending cuts are due to take place by law unless the status quo is changed. Ultimately, the implementation of those fiscal measures is very likely to send the US spiralling into a recession. Hopefully they can come to some agreement beforehand. In yesterday's US session, Apple led the pack as corporate results surpassed analysts' estimates, helping to interrupt Friday's steep plunge. However, investors were also cautious about the near-future, wondering whether the recent sales growth can be maintained. As a result, amid limited volatility, the Dow Jones ended rather unchanged around 13,345. The late recovery by US stocks was enough to give European indices a small uplift on the open today. However, those early gains have been given up by the FTSE 100, and we are now firmly in the red as a bit of a sell-off takes place. Currently trading at 5855, it looks like support for the FTSE 100 is around 5845/25. Given some of the recent trade, we could easily see traders testing the support before attempting to take out the near-term resistance at 5930/55. There's little on the economic calendar today, although this morning's UK mortgage approvals will be of interest to see just how the Funding for Lending scheme is helping to boost supply and demand. It's still not easy to secure a mortgage in today's market, so we can't expect a huge uplift, but a rise from 30.5k to 31.2k is expected. On Friday, the Dow Jones took a real tumble, falling over 200 points on the back of dismal corporate earnings in the US. Well-known brands like General Electric, Microsoft and McDonald's scared investors into thinking that the real economy is still struggling to recover, with poor existing home sales accentuating the plunge. Clients that have consistently sold the US indices were finally rewarded for their persistence, but the more bullish investors out there might see this as a buying opportunity. The Dow Jones is currently at its 55 day moving average, around 13,300, the same level it bounced off a week ago. This support might prove to be fairly tough to break below as it was previously resistance from back in March and April. This morning, European indices have got off to a negative start following the big falls in the US, with the FTSE 100 dipping below 5900 to 5880 at the time of writing. Towards the end of Friday's session and much earlier this morning, we had been calling the FTSE 100 as far down as 5850, which did seem a little excessive. Nevertheless, a degree of normalisation has brought us back up, with a few people thinking this might be a good chance to buy again following the dip. Whilst the Google share price plunged over 11%, a positive reading for Philadelphia manufacturing ensured the stock market indices held up quite well. This acted as good support for the Dow Jones, with the index ending rather flat at 13,542. This morning, European indices are mixed and largely flat, hovering around their recent highs. At the time of writing, the FTSE is at 5912 and still holding onto the 5900 level. As a result, the near-term support and resistance haven't changed, with eyes on the 5885/35/5770 and 5930/50 levels. Yesterday's US session was very flat, with the recent momentum seeming to temporarily dry up as decent housing starts were countered by weaker corporate numbers from IBM. 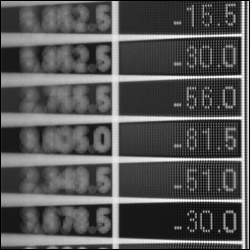 This morning, there's a little bit of red across the screens of European traders, with the FTSE 100 lower by a handful of points at 5905, just managing to hold onto the 5900 level. The bulls seem to be having a breather as we go into the EU summit, and rightly so considering that we're up by over 2% this week alone. Key near-term support and resistance levels are seen at 5885/35/5770 and 5930/50 respectively, but it's all eyes on the support levels to see if the index can maintain its upward momentum. Also see today's feature, A Time for Greater European Fiscal Integration? Yesterday's US trading session saw the Dow put on another triple-digit gain as positive US industrial production figures spurred continued buying in the stock market. Additionally, a string of better-than-expected corporate earnings contributed to the rally, taking the Dow to back above the 13,500 level to settle at 13,551. It was the third straight gain and has taken the US index back above the short-term moving averages, with the long-term trend still on the upward path. On this side of the Atlantic, the bullish sentiment is rippling through indices, keeping them well supported following some impressive recent gains. At the time of writing, the FTSE is flat-to-positive at 5875. Financial Spreads' clients will be hoping that the current strength comes to an end, since they've been on the wrong side of the move for the duration of this rally. Near-term support and resistance is seen at 5850/35/5765 and 5905/30/50 respectively and the bulls look to be in control for now. Sentiment is being assisted by the prospect of improving conditions in the Eurozone, with Spanish borrowing costs remaining capped and ongoing negotiations in Greece seemingly going well. Today, the focus is very much on UK unemployment figures, which have been consistently surprising economists. Temporary hiring during the Olympics will have certainly helped, but claimant counts are likely to have risen in September as the outlook for jobs and growth remains distinctly challenging. Also see today's feature update on the US Presidential Election and the Financial Markets. Today sees a little more excitement for financial spread trading markets as we get inflation figures from the UK and the German ZEW survey. For the UK, inflation is likely to take the next step back towards the BoE's target of 2%, with expectations of the rate coming in at 2.4%. Nevertheless, there may be a larger move to the downside as this September hasn't seen the energy price rises that were introduced in September 2011; we can look forward to those later this year. For Germany, the current conditions reported by ZEW are expected to decline as things on the continent aren't looking all that great and a deeper recession is looming. Despite this, the economic expectations are due to improve a little. This morning, European indices are heading higher in early trade and our earlier calls were spot on, with the FTSE 100 rising by 30 points to 5835 at the time of writing. FinancialSpreads' clients are opposing the move by selling into the strength of the last couple of days, expecting the range bound moves to continue. Recently, the FTSE 100 has continued to bounce between the highs and lows on low volumes and volatility. Without a breakout in either direction, the index may well turn lower. Also see today's feature on Scottish Independence and the Markets. On Friday, investors were kept on the back foot as we saw increased uncertainty regarding corporate America's earnings after the IMF had downgraded their global growth projections. The Dow lost 38 points to 13,313, despite a jump in consumer confidence and a fall in jobless claims figures earlier in the week. Nevertheless, we are currently calling for the Dow to open some 40 points higher at 13,353, as the European indices start the week in a positive mood. This week's highlight will be Thursday and Friday's EU summit. European politicians will be able to catch up on what they did during the summer holidays, whilst maybe touching on the topic of an EU wide banking union and what to do with Greece and Spain. Some investors seem to be positioning themselves for an imminent Spanish bailout as they push risk assets higher this morning. At the time of writing, the FTSE 100 is trading at 5810, well above our initial calls. Also see today's feature on the US Presidential Election and the Financial Markets.